Say ‘goodbye’ to lawn care because TigerTurf Diamond Supreme Fescue will maintain an evergreen plush appearance all year long, no matter the season! Specifically designed with the strongest yarn in the industry, Diamond Supreme Fescue turf is one of the most popular choices among certified landscape contractors across the nation. This synthetic turf showcases field and olive green colors combined with a brown thatch layer. The extra thick approximately 85 ounce face weight combined with an approximately 2.50 inch pile height will make any landscape appear lush and natural. The open ‘W’ grass blade shape has a memory foam action and will retract to its original shape, even after heavy foot traffic! 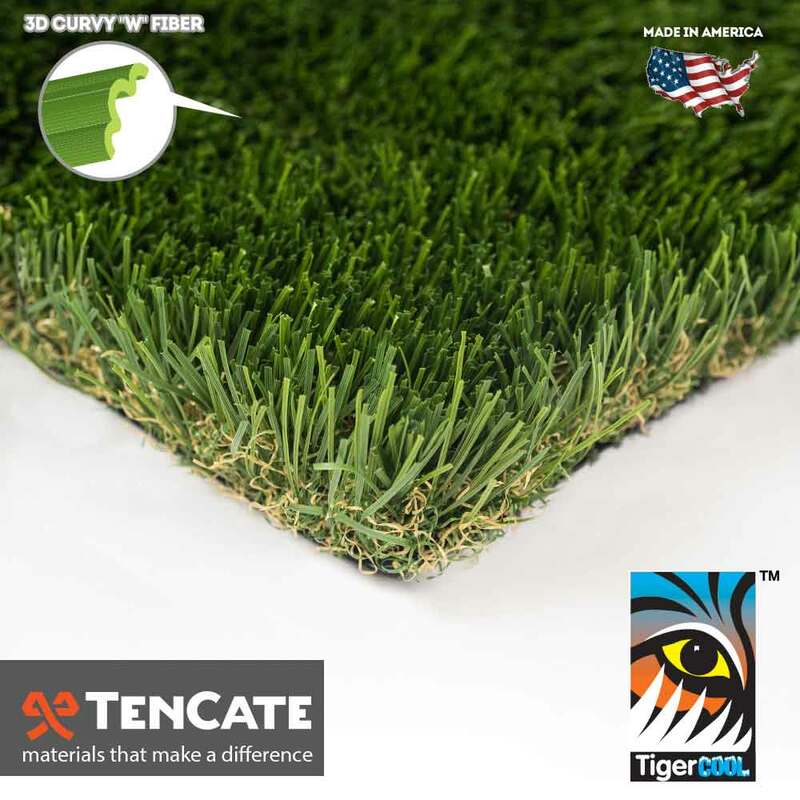 Our featured tuft bind technology also provides this turf with an exceptional backing! The grass blades are triple reinforced which creates an extreme resistance to a pull force. It would take several thousand pounds of resistance force per linear foot to separate the turf from this backing. In addition to incredible strength, the backing is also perforated for easy drainage! Pet urine, water and any other liquid will simply strain through this backing and your turf will stay pristine as the day you purchased it! Our 15 year warranty guarantees Diamond Supreme Fescue to save you time, water and money in addition to maintaining a flawless look for years to come! A perfectly manicured lawn never looked so good!